Etkin is dedicated to providing comprehensive, real-time information on all available properties to brokerage professionals. 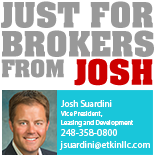 We welcome broker submissions and will make every effort to meet your client's facility requirements. We appreciate all your efforts to lease our available space and market our prime build-to-suit sites. We encourage and welcome broker suggestions. Please email info@etkinllc.com or call us at 248-358-0800.